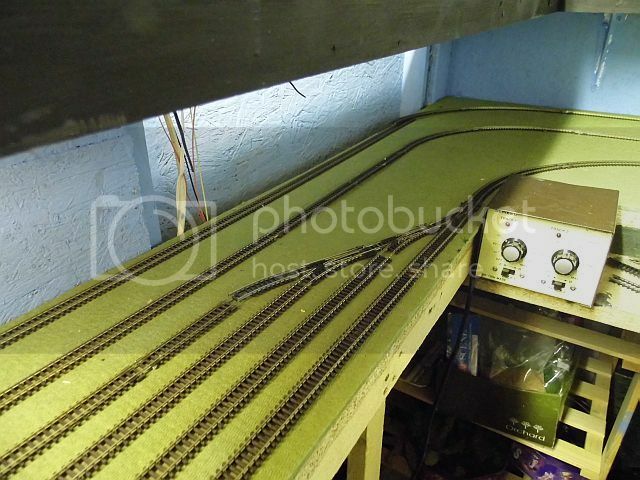 As I have a thread for my WPR layout I thought I'd start a new one for my BAR layout. Those that have followed by previous layouts will know I scratchbuild or convert a lot of my BAR stock and I have more to do. 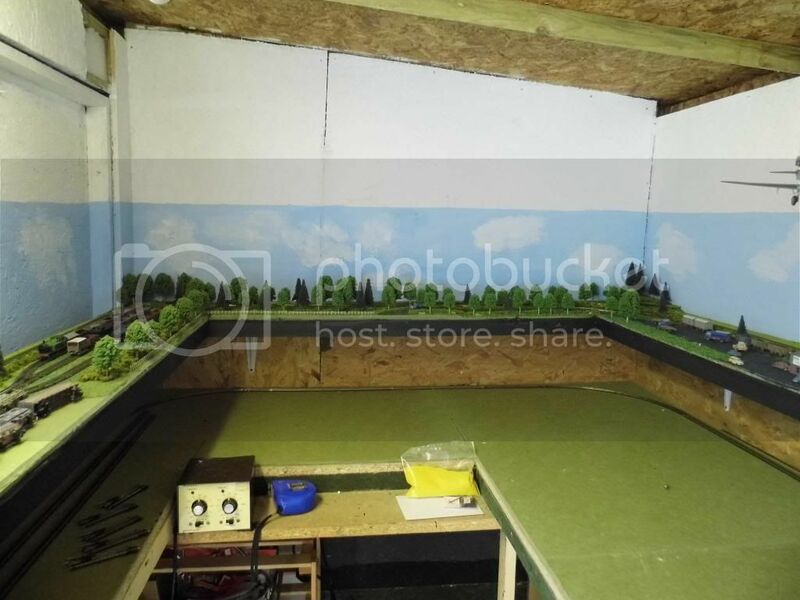 This will be my main layout and take sup most of the shed space. 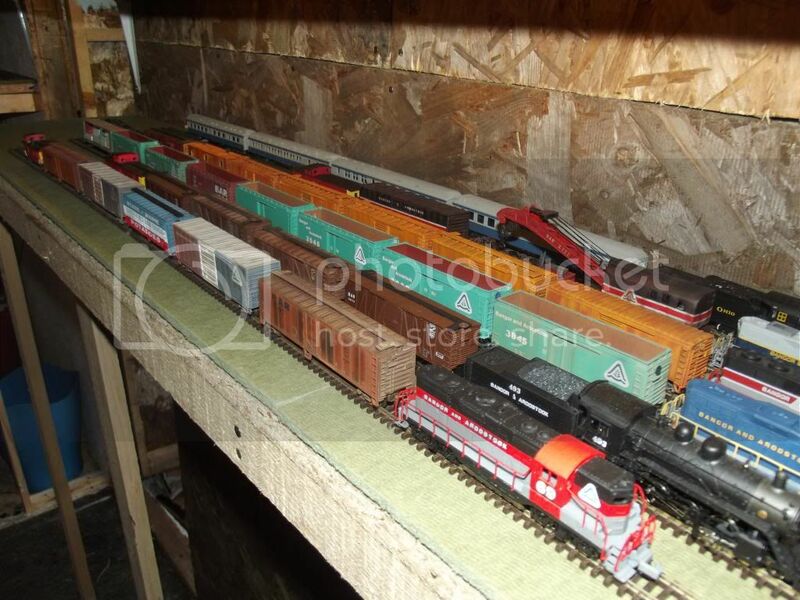 Along one side will be the fiddle yard, although I plan to make it more like a switching yard like this. The two top tracks will be through running and the rest will be for the lower bottom track which will go through most of the small industries I plan to add. Although the boards have been down since I moved into the shed earlier in the year I have only just fixed them into place today. The backdrop has been painted light blue. 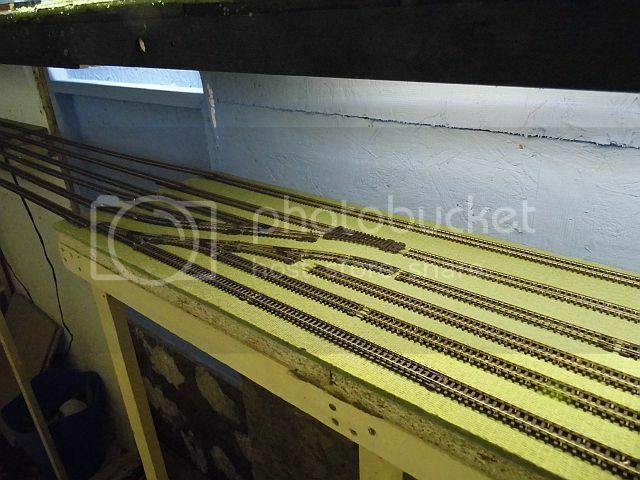 Tomorrow I plan to get the top fibreboard in place and make a start to track laying. I've no track plan. I just make it up as I'm going along, but I know what I want to include. Tunnels and densely wooded inclines. As it was quite mild tonight I've glued down the top layer of fibreboards. Track laying next. Maybe tomorrow. Going to sell off some excess stock at weekend. Mainly Baltimore and Ohio stuff, but some other odds and sods. 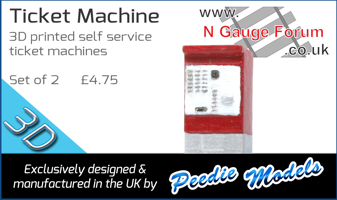 Need the pennies to buy new stock. 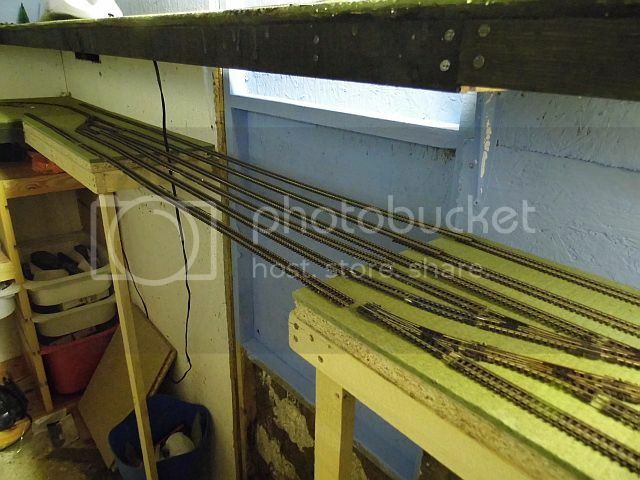 I've had a rethink on my fiddle yard and I can now squeeze in extra storage tracks. As the length of the wall are about 13ft I can get two separate storage yards. The gap is for a lift out section, that I've still to cut and fit. The track closest to the wall will be a straight roundy - roundy circuit for my preservation special. The next track down is the West bound track with three storage yards. 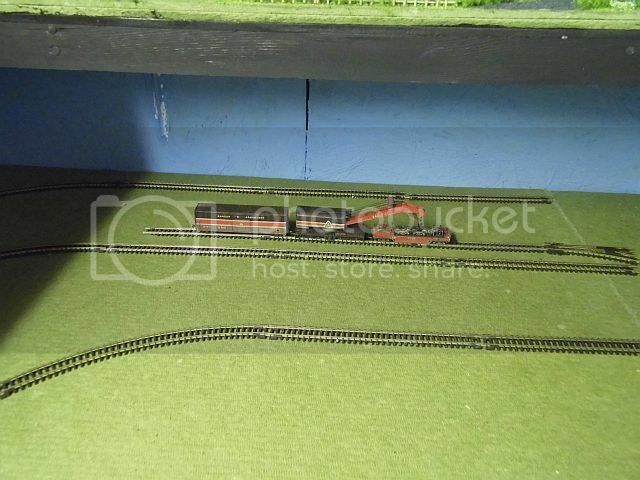 The bottom track next to the board edge is the East bound track with another three storage yards. So I can run three trains at the same time and store six more in the yards. Around to the first end wall there will be a storage siding for the BAR wrecker and an engine shed for one of my 2-8-0 Consolidation steamers. 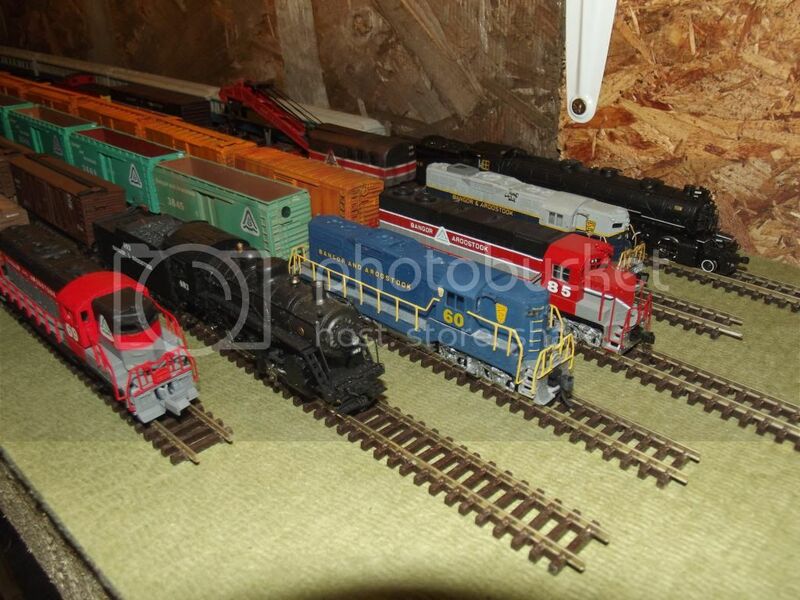 There will be some extra storage sidings at the various industries down the opposite wall. Need to get some more points. Before you mention the danger of trains dropping off the front edge there will be a 3 inch perspex strip along the board edge to stop them falling off. Yeah, I could but I like to run different trains and I have 7 BAR engines. Sorry, Alex, but I meant you have a 13ft length split into 2 fiddle yards (each of 3 roads) - hence the envy button. The longest siding is 4ft and will hold an engine and 12 freight cars. The shortest is 3ft and will take an engine and 8 freight cars. Should be enough to play with.